In contrast to the many sizing options for rings and necklaces, there is far less variety in bracelet sizing. Most bracelets are made to fit most people. Bracelets may have links that can be removed or clasps that allow for adjustments in length. The ideal bracelet will fit snugly enough so it will not slip off the hand, but loose enough to allow for movement. For women's bracelets, the standard sizes fall between 6.5 and 7.5 inches in length, with 7 inches being the most common length. For men, standard sizes fall between 7.5 and 9 inches, with 8 inches being the most common length. You'll find bracelet length measurements available on each Sorella bracelet product page. 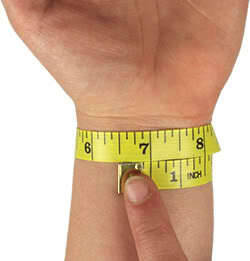 Of course, when ordering online, it's important to measure your own wrist to determine if the fit will be comfortable. This can be done by wrapping a flexible tape measure or a ribbon around the wrist at the wrist bone. Most bracelets have a clasp; however, if you're measuring for a bangle or any other bracelet without a clasp, the bracelet needs to be able to fit over the widest part of your hand, so measure that part accordingly (usually this is the span across the first set of knuckles of your four fingers, not including the thumb). Once you've determined the appropriate measurement of your own wrist, add 1/2 - 1 inch to that number (depending on the desired fit) to determine your bracelet size.